A new book on Enoch Powell reappraises without rehabilitating. If only it were so easy. If only one had but to mouth the name ‘Enoch’ and racists everywhere fell silent. The reality, of course, is that recent years have seen a serious attempt to rehabilitate Powell and defend his politics. The faux-outrage at Nigel Farage’s recent comments were accompanied by yet more airtime for UKIP’s policies and a (normally unspoken, occasionally explicit) – well, was he right? Camilla Schofield’s recent work thankfully does not ponder whether ‘Enoch was right’. A biography-meets-social history, Enoch Powell and the making of postcolonial Britain is a well-researched and necessary corrective to the usual hagiographies. For Schofield, attempts either to humanise or dehumanise Powell ‘fail as history’. Perhaps, but a cool and critical distance is precisely what Powell’s defenders past and present call for. Of course, they acknowledge, his language and manner was inappropriate, but… This is not to say this book is sympathetic toward Powell, and there are advantages to Schofield’s approach. Powell emerges not just as a bigoted individual, whose craven deference to authority and hierarchy trumped all other political principles, but as a man who was forged by the decline of Empire, the scared Englishman trying to reassert his place in the world. In this way much more than just the life of Enoch Powell is discussed. As the publishers’ endorsement says, ‘through Powell, Schofield illuminates the complex relationship between British social democracy, racism and the politics of imperial decline in Britain’. The book certainly does all these things, but the emphasis on using Powell as vector can be tiresome. Schofield’s mastery of Powell’s extensive archives is apparent, but some readers may find extended exposure to Powell’s opinions and those of his letter-writers unappealing. Further, the relationship between ‘post-colonial’ Britain and popular racism could benefit from an extended consideration of Britain as a neo-colonial power. While Schofield considers the links between migrant communities and independence struggles elsewhere, those between post-war British foreign policy and popular racism are less developed. Nonetheless, as a biography, this book provides a definitive account of Enoch Powell the man. Powell’s years spent in Egypt and India during the Second World War are shown to have left a lasting impression. While plenty who experienced the horrors of war came away with quite different views, it embedded in Powell a love of war as the ultimate sacrifice to the nation, and a profound belief in the superior place of the English. In 1947, for example, Powell tried to convince Churchill to impose martial law in India. Powell was convinced the ‘unique and necessary’ presence of the Englishman in India would be forever welcome, and that martial law would be hugely popular. For a man who is so often portrayed as an exceptionally intelligent (if perhaps misguided) individual, Powell’s absolute inability to understand the significance of national liberation makes him appear something of a fool. Likewise, Powell’s mastery of several languages never allowed him to develop more than the most patronising of appreciation for cultures other than his own, and thankfully Schofield does not dwell on whether his ability to speak Urdu implies a position of racial tolerance. Schofield shows that Powell’s influence in British politics began before and extended well beyond the ‘Rivers of Blood’ speech. In 1959 Powell spoke in a Commons debate on the Hola massacre. Hola was a detention centre in use during the ‘Kenyan emergency’ and was the site of the beating to death of eleven alleged Mau Mau fighters. The murder of eleven was relatively small change in a counter-insurgency that saw the death of as many as 100,000, but it was this particular atrocity that caught the headlines back in London and forced a political response. The House was divided between Tories denying any wrong had been done (Conservative MP for Leicester South John Hall dismissed the victims as ‘sub-human’) and Labour demanding an inquiry. When Powell rose to speak, late into the night, six hundred MPs are said to have sat ‘spell bound’. Powell broke with the party line, condemning the treatment of Mau Mau prisoners and arguing that the responsibility for the deaths at Hola lay with the Kenyan colonial ministers. Ever since, and still today, Powell’s ‘Hola speech’ is used by his supporters as the counterpoint to any accusation that Powell was racist. How could he be – he said the merciless beating to death of unarmed prisoners was the wrong way to govern a colonial subject! Even Michael Foot would conclude ‘I do not think he was ever a racist’, in light of the Hola speech. Schofield shows that ‘for all the drama surrounding the debate … little is actually made of the contents of his argument.’ Powell’s response to the Hola massacre was to retell it as ‘essentially un-British … the actions of colonial forces without British leadership.’ Powell’s line of argument was to be adopted wholesale by the British state in the years to come. ‘Nothing to do with us’ would be the mantra whenever awkward questions were raised of the Mau Mau, or the Aden, or Cyprus, or – the list goes on. Of all his poisonous legacies, this was one of his most insidious. Powell eased the way for the state to deflect all ongoing responsibility for the manifold crimes of empire. As late as 2013, the British government would argue in court it had no case to answer to elderly Kenyan torture survivors because responsibility lay not with the British state but with the colonial administration, a responsibility passed on to the Republic of Kenya at independence. That a speech that precipitated such a profoundly racist policy can be trotted out in support of Powell-the-non-racist is rather dispiriting. The speech ‘despite all [its] intellectualism’ as Schofield puts it, ‘sounded definitively fascist’. What happened next is well known. Powell was sacked from the shadow cabinet by Edward Heath and roundly condemned by the mainstream parties (and even Oswald Mosley) for its tone. Immediately, the argument that Powell’s style was misguided but he reflected genuine fears was put forth, as it still is today. He was disciplined by his Conservative colleagues not for his views, but for how he went about airing them. The distinction between content and style mattered little for many. It took only ten days after the speech for the consequences to be reported in Wolverhampton, where fourteen young whites attacked and stabbed West Indian partygoers at a Christening, chanting ‘Powell’ as they did so. The true substance of Powell’s address was to create a bridge between the Tory Right and the fascist fringe, both of which were able to recruit and expand in its wake. Dockworkers famously struck in support of Powell, but were actually joined in protests by workers across England including immigration officers at Heathrow. On May Day 1968, some of those same workers would end the day fighting with students demonstrating against Powell outside the House of Commons. The majority of his supporters stayed indoors however. Powell’s middle- and upper-middle class support base preferred to write letters. By 1970 Powell even had his own supporters’ magazine, the Powellite. The name was a pun on the anti-fascist magazine Searchlight, and solidified the link between the Tory and the fascist Right. The magazine was edited from the home of close Powell confidant Beryl ‘Bee’ Carthew, who joined the National Front in 1975. Her same home address would later be listed as the headquarters of a West London branch of the Front. Powell wrote to her saying he would never condemn her abandoning the Conservatives, and told her he did not consider the Front dangerous. His only objection to the National Front appears to be that he was ‘obstinately … parliamentarian’, and saw no future in the smaller parties. Powell’s racist interventions were by no means confined to the ‘Rivers of Blood’ speech. Throughout the rest of his life Powell found himself a regular ‘go-to’ immigration discussant by the media. As in 1968, his racist pronouncements would be followed by racist attacks in the streets. Britain’s black communities and new migrants did not take the explosion in popular racism Powell caused lying down, and if there can be any positive element to his legacy it is this. As the dockers marched in support of Powell, fifty separate organisations joined forces under the banner of the Black People’s Alliance. A year later, in 1969, up to eight thousand demonstrated in a ‘March for Dignity’ against racism and the 1968 Immigration Act, a turning point in Britain’s burgeoning black power movement. Placards bearing ‘disembowel Enoch Powell’ were carried as diverse groups from the Afro West Indian Action Committee to Irish republicans marched in what made the news as the ‘battle of the Strand’ [WMV, 7.1MB] . Meanwhile outside 10 Downing Street, as Schofield recounts, an effigy of Powell was ripped from a coffin and set alight. One half of the coffin was painted black, labelled Common, the other, white, was marked Wealth. 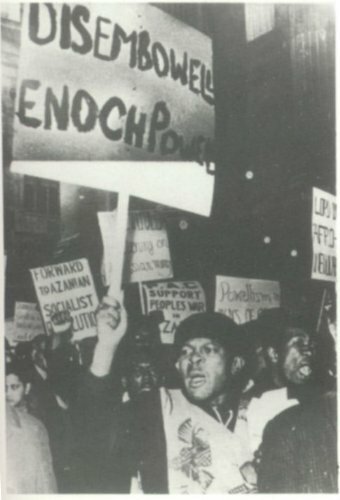 The march and the Black People’s Alliance were quickly followed by more organisation and activity that laid the ground for the anti-racist campaigns of the following decades. An anti-racist, anti-imperialist resistance flourished in the face of Enoch Powell. Inspiration for the fight against those who would reanimate Powell can surely be found in the history of struggle that emerged against him in life. Camilla Schofield's Enoch Powell and the making of postcolonial Britain is available from Cambridge University Press.